Sebastian Kurz was born in 1986 in Vienna. In 2003, he started to become engaged within the Young Austrian People’s Party (ÖVP). 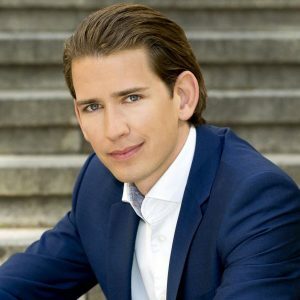 One year later Sebastian Kurz started studying law at the University of Vienna. After several years of commitment on district level, he was elected to the Chairman of Young ÖVP Vienna in 2007 and one year later he was elected as Federal Chairman of Young ÖVP. Until his appointment as State Secretary for Integration in April 2011, he was active as a Member of the Vienna City Council. On December 16th 2013 he was sworn in as Austrian Federal Minister for Integration Issues, European and International Affairs.